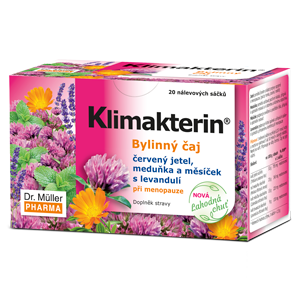 Klimakterin products help women in coping with the signs associated with menopause and climacteric. The products contain red clover extract as the main active substance. Red clover is used traditionally for its high content of natural phytoestrogens, substances similar to female hormones helping women in coping with hot flushes, restlessness and irritation, which are the signs associated with menopause. Tea also contains lemon balm the substances of which induce peace and relief. Soya bean extract extract in the capsules contains phytoestrogens like red clover. Vitamin D contributes to maintain normal condition of bone and teeth. 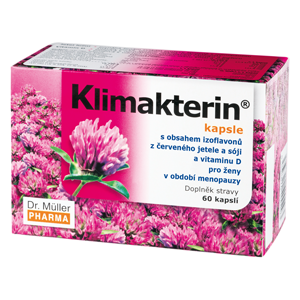 Product containing red clover and soya isoflavones and vitamin D for menopausal women. Do not exceed the recommended doses. The product does not substitute varied diet. Not intended for children, teenagers, pregnant and breast-feeding women. Do not use if you suffer from a blood clotting disorder, or if you use any medicines influencing your blood clotting. Not intended for women who went through breast and uterus cancer. Keep out of the sight and reach of children.